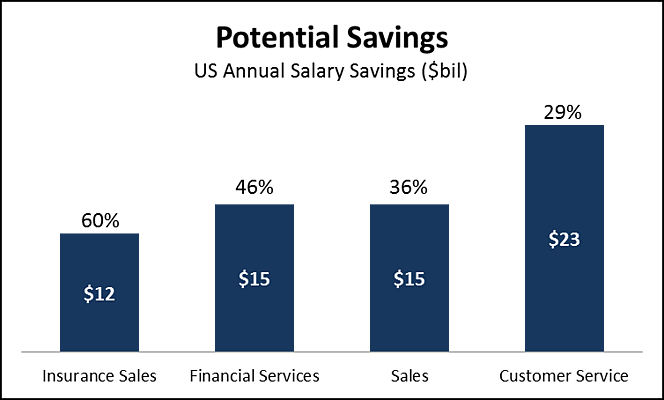 The figure below suggests that a potential savings of $23 billion can be achieved in the U.S. as Chatbots have the potential to automate 29% more of the tasks done by contact center staff today. I know what you're thinking: "Getting an additional 29% cost savings through automation would be amazing, but how is that even possible?!?" OK. Maybe so, but lets take a closer look and see why it's worth paying attention to Chatbots. 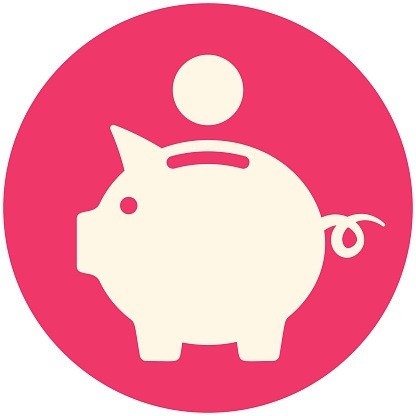 We are in the business of automating customer interactions and saving contact centers money. For customers with a lot of volume, increasing automation rates for routine ineractions can result in millions of dollars a year in savings. Our IVR automates inbound calls, allowing more callers to self serve and reducing the number of calls transferred to live agents. Strictly speaking, this can certainly reduce the number of agents needed to operate the call center. Capacity gets balanced. If the contact center was already operating above its reasonable capacity (a typical symptom is excessively long wait times) the increased automation rates reduce transfer rates, reduce queue time, and balance things out (usually increasing CX scores in the process). Agents shift to new positions. If fewer agents are needed in one area because of automation, this creates an opportunity to repurpose them to another area. For example, they may be retrained with a new skill set such as becoming specialists in cross-sell and upsell. Attrition gets offset. Most contact centers have high turnover, and hiring and training new agents is expensive. Higher automation rates can offset attrition, allowing the contact center to handle more inbound calls without replacing as many agents as they leave. All these actions provide material cost savings through productivity improvements instead of directly cutting jobs. Although web and mobile self-service interactions now outnumber interactions over live-assist channels, contact centers are still adding staff. A survey of contact centers found that 64% plan to expand the number of seats in 2016 to meet demand from customers, compared with just 6% that plan to reduce their workforce. As we move to a digital engagement environment for customer service, the customer will have more power and more control over when and how they get things done. Self-service will increase with the advent of better automation. But when the digital customer needs help they will expect a higher level of skilled help than in the past. That means agents will need to become more skilled (which likely means they'll be more expensive to recruit and retain). The report says the 29% savings will come from bots and other technology. We know that the same machine learning, analytics and AI technology powering bots is being applied to all areas of the contact center--queuing and routing, customer relationship management (CRM), and workforce optimization technologies. Surely these areas will also account for some of the 29% savings. Customer service is a very complex process and function. But OK, what about that projected 29% cost savings? Let's just focus on self-service, automation and Chatbots for a moment. Today your contact center almost certainly has some level of automation supported by the IVR and your website. To shift an additional 29% of interactions away from agents to self-service requires a significant increase in automation, and that automation will need to be able to handle increasingly complex interactions. In some cases this is will not be possible. For some clients we automate 98% of inbound calls with our IVR and you just cannot squeeze any more from those kinds of interactions. But for the majority of interactions with contract centers, additional automation is possible. Yes you can push an incremental improvement in self-service by adding functionality into the IVR or improving your website. But we're talking about massive, not incremental, savings. Mobile messaging apps and Chatbot-based self-service hold the promise that more self-service can be done than you’ve ever thought possible. Chatbots allow you to rethink your customer care strategy in a big way. Chatbots are an immature technology that isn't capable of delivering the 29% savings today. Some even claim that as much as 98% of today's Chatbots are worthless to enterprises. You’ll have to develop new strategies for engaging your customers... because your current customer care strategy cannot get you that incremental 29%. Chatbots can, however, deliver benefit to your bottom line now. For example, we have a simple Chatbot that delivers targeted smart content to customers that reduces the effort needed to find information. It’s simple and it works, plus it delivers savings by increasing self-service rates even after the customer enters the messaging channel. Check out this Chatbot framework blog post that can help you think about what is possible and where automation is headed. Hint: start simple. Chatbots maybe one of the new technologies that allow the contact center to get to a new level of efficiency and cost savings. It won't be the only technology that gets us there but its worth considering. So here is the our recommendation: Find a way to pilot Chatbots and get in the game. We’ll need to test and learn how best to take advantage of this new technology and achieve the promised savings. (If you want to try out our Chatbot, contact me). 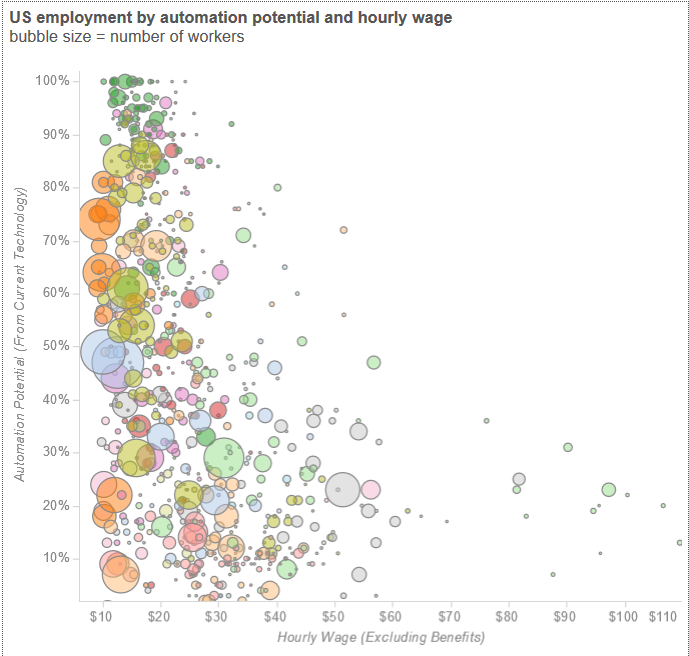 Check out how much of your job can be automated with this cool interactive graphic by Tableau. As a marketing guy, 13% of my job can be automated... so I can be 13% more productive.